We ship all goods via Australia Post normal postal service. Shipping charges can be influenced by the size and weight of the product and your location. Exact shipping costs are calculated in the shopping cart and will be added to the order total before checkout. We only ship goods within Australia. All goods ordered using our online system will be shipped within 2-3 business days for Metropolitan areas, allow an additional 1-2 days for country deliveries. Please note public holidays may delay orders. Please choose carefully as we do not provide refunds on stationery unless goods arrive damaged or incorrectly described on the website. 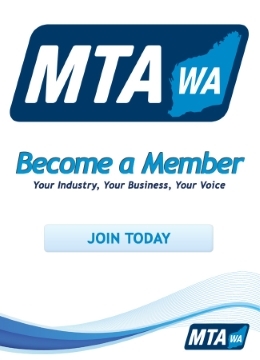 Inspection by MTA WA staff will be required before any refund will be considered. There are no refunds for any online training courses. If notice is given to the MTA WA at least 7 days prior to the course commencement date, a 100% refund will be offered. If notice is given 7-4 days prior to the course commencement date, a 50% refund will be offered. If notice is given less than 4 days prior to the course commencement, there will be NO refund. If the course is full at the time of booking, you will be advised of another date. If you re-schedule or cancel 4 (or more) weeks prior to the course commencement date, you will be required to pay $150 (administration fee). If you cancel/re-schedule within 4 weeks of the course commencement date, you will lose 50% of the course cost.